Salt cavern repositories are ideal for safe isolation of solidified hazardous waste. 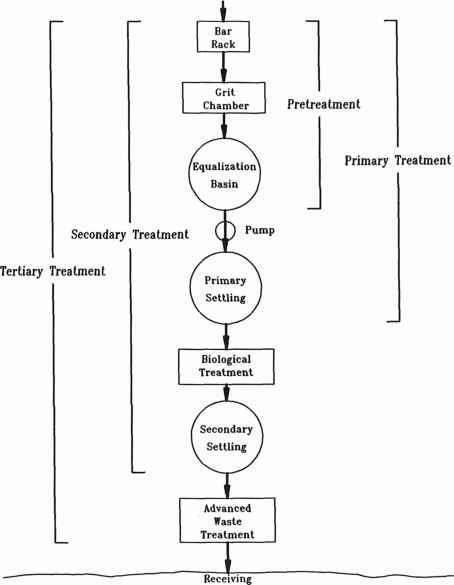 The subsurface disposal facilities can be designed and constructed in such a way that there is virtually no possibility of escape of the contaminants within the time frame to perpetuity (defined as 10,000 years by EPA). Solution-mined caverns in dry domal salt meet the requisite criteria for this demonstration and provide the only plausible solution to this problem, for the foreseeable future. Fortunately, dry stable salt structures, of which the North Dayton dome is an excellent example, are plentiful and provide the requisite qualities of strength, stability, flow properties, and impervious containment capabilities for ultimate waste isolation. Thus, a salt cavern repository provides an excellent natural system that excludes waste from contact with the biosphere. The bore hole from the land surface to the top of the salt cavern is the only pathway connecting the waste to the biosphere. For permanent isolation, this avenue must be eliminated, not by means of an engineered solution, but by permitting natural isolation to occur. To achieve a natural seal, the 100-ft section of uncased hole in salt (Figure 11) extending upward from the top of the cavern, will be sealed by salt that has recrystallized to a salt rock possessing physical properties as good as or better than the in situ salt of the confining zone. 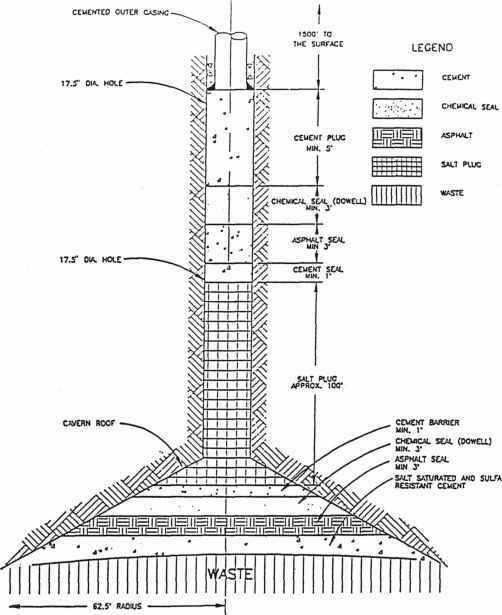 This can be accomplished; however, several years may be required to achieve a permanent natural salt seal, during which time an impermeable salt-saturated expansive concrete and chemical and asphalt seals (Figure 12) placed above the waste at closure will provide a reliable interim shield. Closure of bore holes in salt has been the focus of considerable research in the last decade, spurred primarily by the need to develop methods for sealing openings in bedded salt following storage of military-generated radioactive waste at the Waste Isolation Pilot Plant (WIPP) and openings in salt structures elsewhere including the HIFI project. In situ rocksalt has nearly ideal containment characteristics, including very low, saturated, porosity and permeability in the 10~21 m/s range. This very low permeability can also be achieved synthetically by consolidation of implaced salt particles. The effects on consolidation resulting from particle size, water content (inherent and added), temperature, pressure, and stress and of the processes responsible for them have been addressed in numerous studies. Figure 11 shows a schematic diagram of the seal, which is the only pathway from the waste-filled caverns at the North Dayton dome to the surface. The seal is placed between the cavern roof and the lowermost cemented steel casing at 1500 ft below the land surface. Properties of the salt-saturated expansive concrete and components of the plug other than salt will provide an excellent seal for the interim period, during which time the permanent salt seal will become effective. Figure 11 Cavern closure seal. unimpeded, the hole diameter will change from 1.46 ft initially to 1.235 ft in 100 years. The closure/creep will result in a 29% reduction in volume over this period. 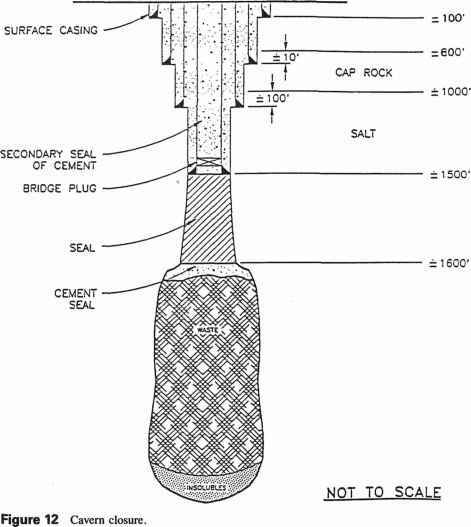 Resistance to closure of the hole will be provided by compression of the contained salt aggregate. 30% initially, an effective seal will be established in less than 100 years. On the basis of observations pertinent to consolidation rates, little difficulty is anticipated in achieving a preclo-sure average salt particle density greater than 80%. Accordingly, the permanent salt seal will achieve optimum consolidation in less than 60 years.